For other uses, see Benedictus (disambiguation). The Benedictus (also Song of Zechariah or Canticle of Zachary), given in Gospel of Luke 1:68-79, is one of the three canticles in the opening chapters of this Gospel, the other two being the "Magnificat" and the "Nunc dimittis". 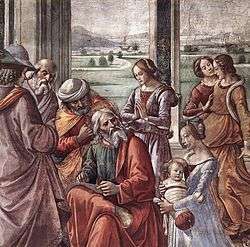 The Benedictus was the song of thanksgiving uttered by Zechariah on the occasion of the circumcision of his son, John the Baptist. The canticle received its name from its first words in Latin (Benedictus Dominus Deus Israel, “Blessed be the Lord God of Israel”). The whole canticle naturally falls into two parts. The first (verses 68-75) is a song of thanksgiving for the realization of the Messianic hopes of the Jewish nation; but to such realization is given a characteristically Christian tone. As of old, in the family of David, there was power to defend the nation against their enemies, now again that of which they had been so long deprived, and for which they had been yearning, was to be restored to them, but in a higher and spiritual sense. The horn is a sign of power, and the "horn of salvation" signified the power of delivering or "a mighty deliverance". While the Jews had impatiently borne the yoke of the Romans, they had continually sighed for the time when the House of David was to be their deliverer. The deliverance was now at hand, and was pointed to by Zechariah as the fulfilment of God's oath to Abraham; but the fulfilment is described as a deliverance not for the sake of worldly power, but that "we may serve him without fear, in holiness and justice all our days". The second part of the canticle is an address by Zechariah to his own son, who was to take so important a part in the scheme of the Redemption; for he was to be a prophet, and to preach the remission of sins before the coming or the Dawn from on high. The prophecy that he was to "go before the face of the Lord to prepare his ways" (v. 76) was of course an allusion to the well-known words of Isaiah 40:3 which John himself afterwards applied to his own mission (John 1:23), and which all three Synoptic Gospels adopt (Matt 3:3; Mark 1:2; Luke 3:4). In the Roman Catholic Church, the Benedictus is part of Lauds, probably because of the song of thanksgiving for the coming of the Redeemer in the first part of the canticle. It is believed to have been first introduced by Benedict of Nursia. According to Durandus, the allusion to Christ's coming under the figure of the rising sun had also some influence on its adoption. It also features in various other liturgical offices, notably at a funeral, at the moment of interment, when words of thanksgiving for the Redemption are specially in place as an expression of Christian hope. It is one of the canticles in the Anglican service of Morning Prayer (or Matins) according to the Book of Common Prayer, where it is sung or said after the second (New Testament) lesson, unless Psalm 100 ("Jubilate Deo") is used instead. It may also be used as a canticle in the Lutheran service of Matins. who has come to set the chosen people free. a mighty Savior from the house of David. and to remember the holy covenant. ↑ "Neovulgate (official text of the Roman Catholic Church)". Archived from the original on 2010-03-15. Wikimedia Commons has media related to Benedictus. List of available settings at Choral Public Domain Library. This article incorporates text from a publication now in the public domain: Herbermann, Charles, ed. (1913). "The Benedictus (Canticle of Zachary)". Catholic Encyclopedia. New York: Robert Appleton.